By now, I bet most of you have heard about this newly opened sorta one-of-a-kind restaurant in Bangsar Shopping Centre - Ruyi & Lyn. You may want to read on to find out what makes them different than other restaurants. The moment you come up to Level 4, look no further because the entire floor is Ruyi & Lyn. It was so spacious that it actually has few different sections to cater to different type of diners, or even for business meetings or individuals! What can I say about the ambiance? It features dim lights setting and modern interior that every corner are so Instagram-worthy! This space is perfect for the casual meetup! How about this kinda hidden area for your book reading area? This huge lobby area definitely an awesome cosy place for your business meetings! It also has a bar too! You can order your favorite cocktail here! What amazed me the most would be this huge spacious dining area! Once you walk through a mini tunnel-like walkway, you will then realize you are actually walking on the runway and the spotlight are on you! This entire area covers not only dining areas, but also private room section, bar, balcony, lounge. Every furniture in Ruyi & Lyn are all designer furniture, hence the more uniqueness of entire interior! The most awesome DJ console! 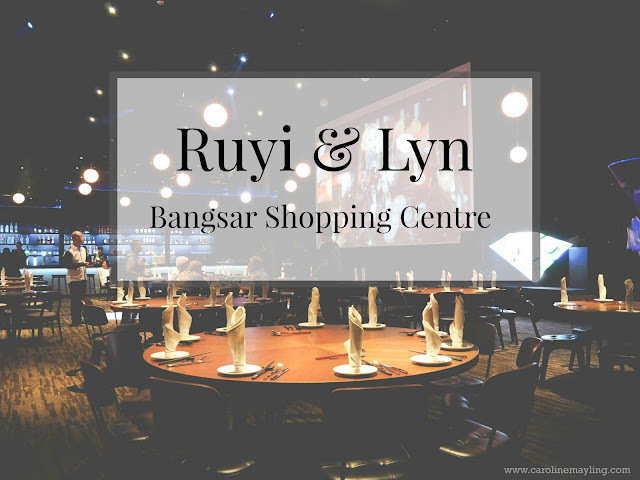 Like Cinderella, when that clock strikes a certain hour, Ruyi & Lyn morphs into a sophisticated clubbing set for its guests to party the night away! Woot woot! Party people, watchu waiting for? You have to make sure you order yourself one of the signature drinks at Ruyi & Lyn - Lyn's Signature, Spicy Caipirinha and Whiskey Sour. I love the three of them, but love Spicy Caipirinha the most! That night, we were also served and get the chance to sample some of the signature dishes at Ruyi & Lyn. Trust me, it was really unique and delicious! Pokemon's Prawns and Symphony Mushrooms were super yums! The Ruyi's Sushi is a MUST-ORDER dish! You'll never regret by ordering this because you'll get to indulge the authentic delicious Hainanese Chicken Rice, Nasi Lemak and Mango Sticky Rice to the max, even though they are in sushi form! This is one of my favorites too! With fresh seafood ingredients on the rice, pour with hot green tea soup base, Eureka Green Tea Rice really is the best comfort food you can ask for! Another signature dish of Ruyi & Lyn - Smoked Little Duck Cones! It's hard to not love this great combination of smoked duck morsels, pine nuts, sweet corn and edamame in a wrap! Ruyi & Lyn offers a selection of modern Chinese pork-free cuisine! As you can see, every plate crafted to be Instagram-ready, Chef's pride in having edible art in the form of photogenic dishes beaming with texture, colour and taste.